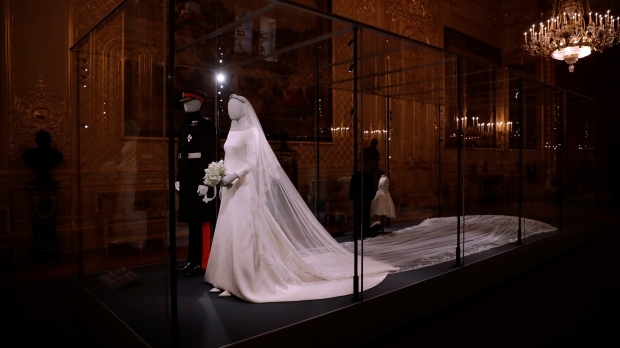 Harry and Meghan Markle recorded their memories of the wedding for an audio commentary that is part of the new “Relive the Royal Wedding” exhibition at Windsor Castle that opens Friday. Meghan described the “incredibly surreal day” when she and her by then fiancé visited Queen Elizabeth II, Harry’s grandmother, to choose a tiara for her to wear during the wedding ceremony. She picked Queen Mary’s diamond and platinum bandeau tiara from the queen’s collection. It is featured in the new exhibit. Harry’s outfit, including the frockcoat uniform made by master tailors on Savile Row, is also display, though likely to be overshadowed by Meghan’s gown and the tiara.